While Barack Obama served in the White House, George W. Bush kept his head down. Barack Obama is not giving the same break to his successor. His attacks on President Trump came in the same week as Bob Woodward’s latest revelations and the New York Times op-ed by an “anonymous” White House insider. Tim Naftali provides insight and analysis on the past, present and future conduct of the world’s most powerful figure. 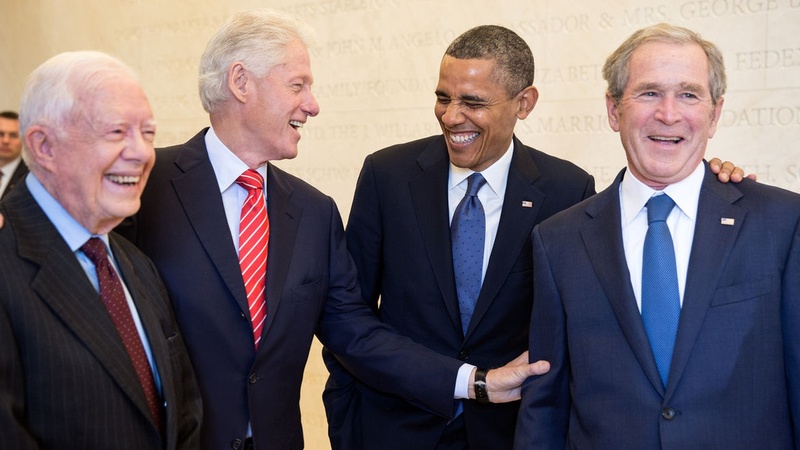 President Barack Obama laughs with former Presidents Jimmy Carter, Bill Clinton, and George W. Bush on the campus of Southern Methodist University in Dallas, Texas, April 25, 2013. Photo credit: Pete Souza/Official White House Photo.